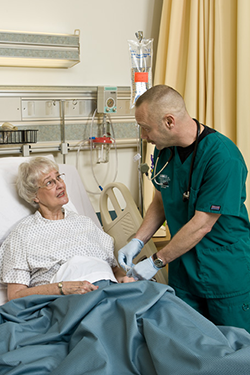 Why Choose the Adult-Gerontology Acute Care Nurse Practitioner Concentration? The Adult-Gerontology Acute Care Nurse Practitioner concentration program of study enables you to assume primary responsibility for the direct care of patients with acute and chronic conditions in a variety of care settings. These settings may include emergency departments, intensive care units, acute care units, or specialty labs, clinics or physician practices. Students can select an area of emphasis such as critical care, cardiology, pulmonary, neurology, oncology, trauma, as well as additional specialty areas. The concentration consists of 13 credit hours of core nursing courses with an additional 37 credit hours of concentration coursework. Students interested in cardiology can complete an optional elective cardiac course, which is an additional 3 credit hour course. For those with a master's degree in nursing, a second master's option is available. The university requires 22 semester hours. A gap analysis will be done to determine the number of clinical hours and didactic courses that need to be taken. Depending upon this analysis, students can complete the program in one to two years. Graduates are eligible for certification through the American Nurses Credentialing Association (ANCC) or American Association of Critical Care Nurses (AACN) as an Adult-Gerontological Acute Care Nurse Practitioner. Requirements are based on previous coursework and experience. All students are required to complete a statistics course prior to NUR 7005: Nursing Research and Evidence for Practice course. While this concentration has a rolling admission with no specific deadline, new students can only start summer or fall term. Individualized plans, including part-time, will be developed on admission by the director of the concentration. Please see the sample curriculum plan for a full-time student. Due Date: This program admits students on a rolling basis. There is no application deadline. Required Documents: The documents listed below should be uploaded directly to your Graduate School online application. Please do not send these materials to the College of Nursing and Health. When the Graduate School application is complete, notification will automatically be sent to the College of Nursing and Health, and we will communicate our application requirements. The College of Nursing & Health will provide instructions on how to complete the above steps once we receive notification of the completed Graduate School application. All CoNH required documents should be sent directly to the CoNH. Have a minimum of two years recent critical care nursing experience.